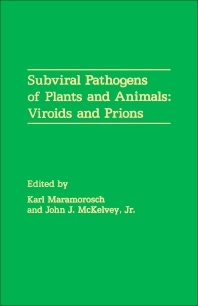 Subviral Pathogens of Plants and Animals: Viroids and Prions is organized into four parts consisting of a total of 20 chapters that discuss the nature of subviral pathogens of plants and animal. This book first elucidates the recognition of subviral pathogens, and then explores the host range of viroids and its diseases. It also addresses the control of viroid diseases. The book explains the structure and replication of viroids. Lastly, it centers on the structure and biology of prions, as well as the diseases these pathogens cause. This treatise will be of considerable scientific interest and importance to those in the field of human and veterinary medicine, virology, zoology, microbiology, plant pathology, entomology, as well as other branches of biology.